Those Sabarot mushrooms are a mix of various types of dried forest mushrooms. Pleurotus Ostreatus (20%); Auricularia Judae (20%). Sabarot Dried Mushrooms have to be soaked for 40 minutes in warm water. They can also be prepared by adding 300 ml of water to 40g of mushrooms and then cook the whole mix 3 minutes in the microwave. After being soaked, Sabarot mushrooms should be cooked as fresh mushrooms. 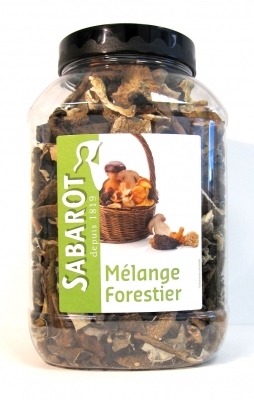 Sabarot Dried Mix Forest Mushrooms are perfect for any kind of cooked dishes such as purees, in pastas or in many other dishes.